Tuesday was SP's favorite day of vacation. We went to Six Flags Georgia with my nephew & niece and my mom. SP loves, loves, loves roller coasters and he hadn't been to a park in over a year. My niece was excited because she had someone to ride all the roller coasters with her. My nephew was all excited about a new ride called 'Monster Mansion.' It was very hot and humid (yes, how shocking for June in Georgia!) and we drank lots of water and frozen lemonade and I got to have a funnel cake (which I love). 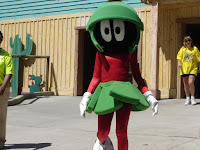 I also got to meet Marvin Martian!!! 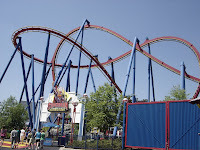 SP & my niece rode Superman three times - it was her favorite. And they rode Goliath twice (SP's favorite). 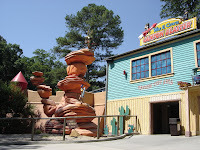 They took my nephew on Canyon Blaster and the Dahlonega Gold Mine roller coasters and on the Monster Mansion ride. He loved them! A good vacation day!